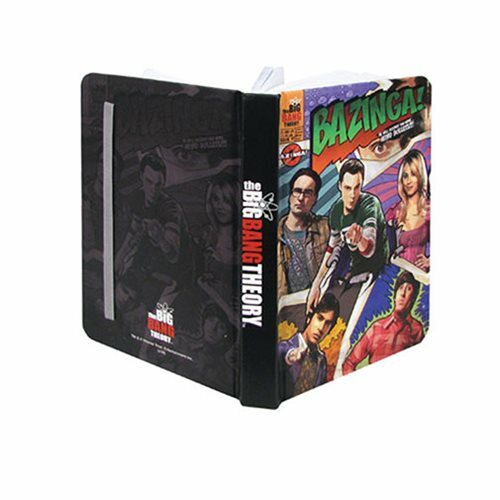 BAZINGA!™ It's a The Big Bang Theory Mini-Journal! Inspired by the TV series The Big Bang Theory. Includes 192 lined pages, elastic closure, a bookmark, and a 4-color cover. Take it with you to all this year's geeky events! BAZINGA!™ It's a The Big Bang Theory Mini-Journal! Measuring approximately 5 1/2-inches tall x 3 1/2-inches wide and containing 192 lined pages, this hardbound book from Bif Bang Pow! features 4-color cover art that includes images of the gang and The Big Bang Theory logo. It also includes elastic closure and a bookmark! Order yours now so you can take it with you to all this year's geeky events! Ages 14 and up.